Irish poet Eamon Grennan will give a public reading at 6 p.m. Tuesday, April 6 on the Emory University campus. Grennan's reading is the third and final event in this year's Raymond Danowski Poetry Library Reading Series, sponsored by the Emory Libraries' Manuscript, Archives and Rare Book Library (MARBL), the Creative Writing Program and Emory College. Grennan is a Dublin native and Irish citizen who has lived in the United States for more than three decades. Educated at University College in Dublin and Harvard University, Grennan taught at Vassar College for 30 years, where he was the Dexter M. Ferry Jr. Professor of English. He is considered one of the premier poets and translators working today, a writer whose work The New Yorker says "illuminates, clarifies, and directs our gaze toward what it is we love but often overlook." 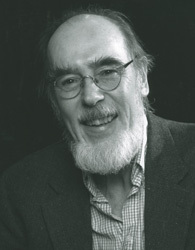 Grennan's books include "Matter of Fact" (2008); "The Quick of It" (2005); "Still Life with Waterfall" (2001), which received the Lenore Marshall Award for Poetry from the American Academy of Poets; and "Relations: New and Selected Poems" (1998). His next book, "Out of Sight: New and Selected Poems," is due out later this year. Grennan's "Leopardi: Selected Poems" (1997) earned the 1997 PEN Award for Poetry in Translation, and a collection of essays, "Facing the Music: Irish Poetry in the 20th Century," appeared in 1999. "Grennan's poetry captures and offers back to readers those fleeting observations that we often let pass unrecorded," says Elizabeth Chase, MARBL coordinator for research services and a doctoral candidate specializing in Irish literature. "He exults in both the natural world and the ordinariness of human experience through verse he describes as ‘celebratory elegy,' and his poems allow us to marvel with him." Selected books by Grennan and a limited edition broadside will be available for sale and signing. The reading, open to the public at no charge, will take place in the Jones Room on Level 3 of the Woodruff Library, 540 Asbury Cir., Atlanta, GA 30322. The theme for the 2009-10 poetry reading series is "Translation." visit MARBL's News and Events.